I love my workspace, I love the natural light coming in and the way music echoes off the walls. I love how cozy it feels and how it’s totally separate from the rest of the house. I love the way scents get trapped and linger forever. There’s nowhere I feel more focused and nowhere I want to work more than here. I wrote about my workspace a while back but this post focuses in on that little copper tray you see in a lot of my photos full of my workspace essentials. 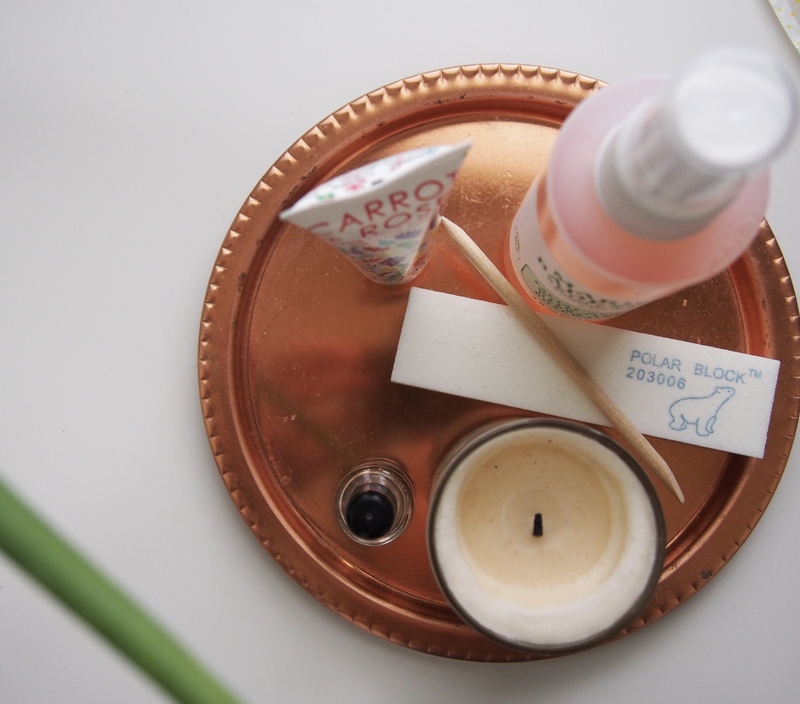 First of all, I’d like to tell you that I have no idea where this little copper tray is from, but pretty much any tray from Urban Outfitters Home or Anthropologie would do the same thing. 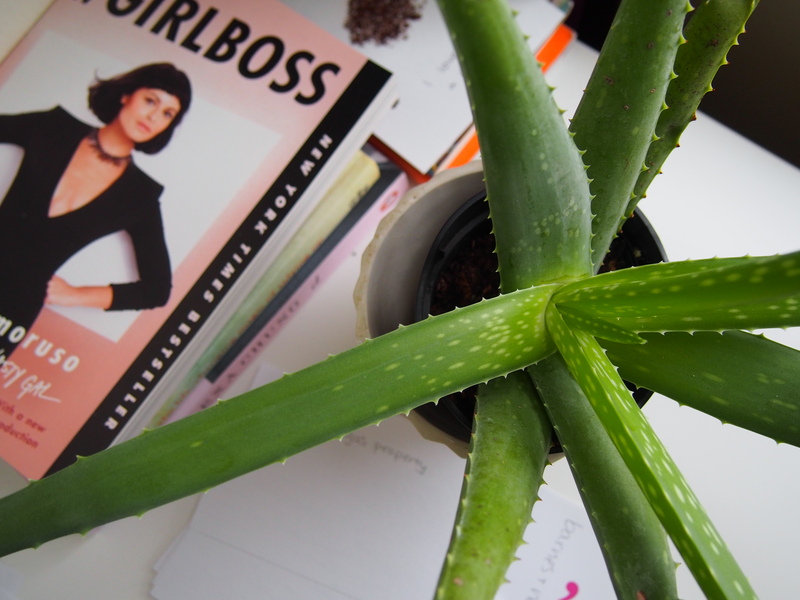 I love having a plant in my workspace to brighten it and give it some life. 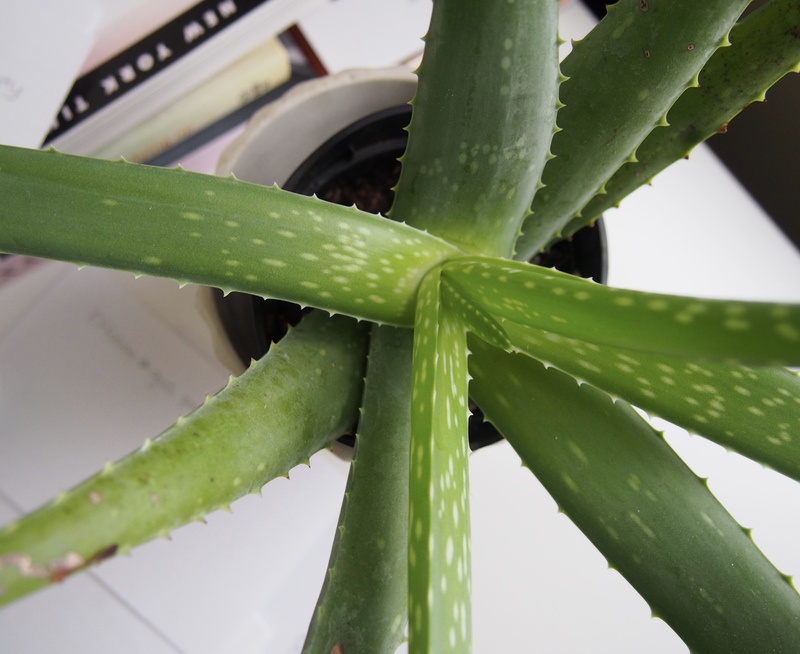 I love watching my Aloe Vera grow and it always gives me a reason to open up the blinds. This is my little copper tray with all my workspace essentials. I must say that I misplaced the lip balm I keep on here, a Burt’s Bees Grapefruit or Hur-raw Green Tea lip balm because my lips dry out incredibly fast. 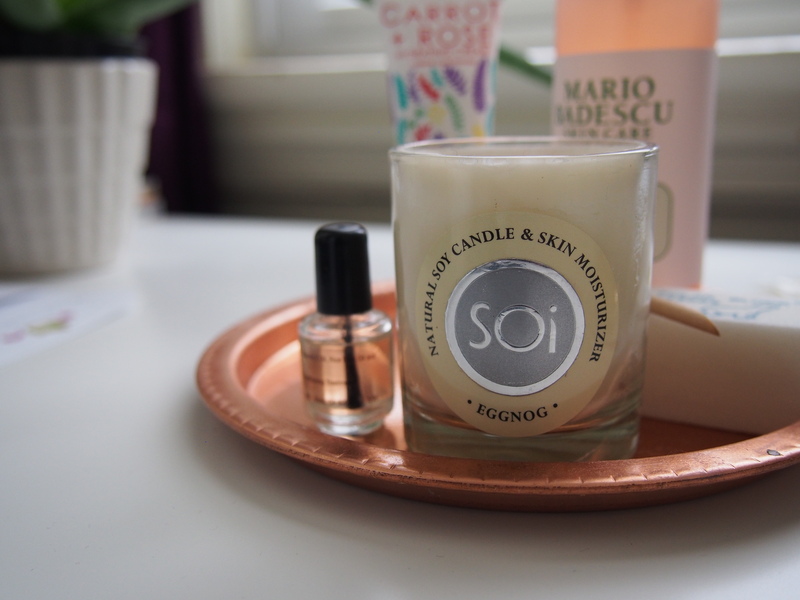 Also on here I have a Soi Candle because they smell so amazing, the one pictured is Eggnog and a nice cozy scent but I rotate between Poached Pear and Vanilla Sugar Cookie. Also on my desk I have a candle that I got from Paris, scented as Lily of the Hills which is one of my favorite scents. That candle is from Collines de Provence. Having two candles (both haven’t even been burned once) just gives off a subtle scent that I really like. Also on there is a Polar Block to keep my nails in order, an orange wood stick to keep my cuticles under control, and a little bottle of Solar Oil which smells like Almond Oil. Almond Oil is one of my favorite scents, and I love using an oil on my nails when they’re looking rough. I also like to keep this Seraphina Botanicals Carrot and Rose hand cream on my desk because it absorbs so fast. I can put this on and go back to typing in 15 seconds with absolutely no greasy mess on my keyboard. It also smells so good, you wouldn’t think that Carrot and Rose would go so well together but do they ever. As a plus, this is vegan, gmo-free, and gluten-free. Lastly is my Mario Badescu Rosewater Facial Spray because nothing dries out my skin like a long night in front of the computer. This is my third bottle of this and it is incredibly affordable if you’re looking for a facial mist. Note: it’s heavily scented so be careful if you don’t like scents. What are your workspace essentials? Leave a comment!